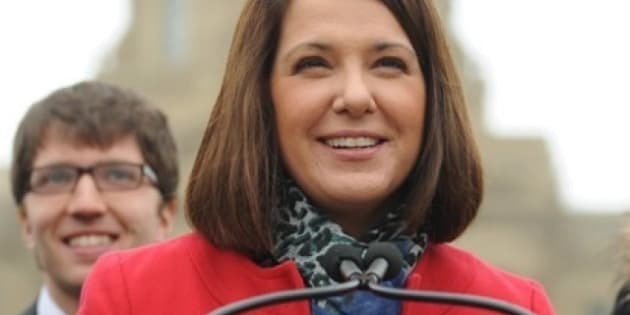 EDMONTON - Alberta Wildrose Leader Danielle Smith says if she becomes premier there will be free votes on all bills in the legislature, even on those that could bring her government down. Free votes are the best way to balance government priorities with the unique needs of constituents, Smith told reporters at a campaign stop Monday. "What I've heard around Alberta is that Albertans want their MLAs to represent them when they're elected," said Smith. "This is essential to restore a properly functioning legislature." The Wildrose says Progressive Conservative politicians in Premier Alison Redford's government have forgotten who they work for. The party points specifically to Tory backbencher Hec Goudreau, who last month threatened school officials in his own riding to stop criticizing the government or risk losing a replacement for their dilapidated school. However, free votes can be a double-edged sword. Parliamentary tradition dictates that if a government can't pass key bills, like the annual budget, it has lost the confidence of the legislature. Another party, or parties, then tries to form government. And if that fails, an election is called. Smith said that if a Wildrose budget failed to pass it might be for reasons unrelated to overall confidence in government. She said there may be a way to hold a subsequent vote specifically on non-confidence to determine where everyone stands. "We'll have to get some parliamentary legal advice on that," said Smith. "But we would like to be able to have free votes on all pieces of legislation, including the budget, and only have the government fail on a true vote of non-confidence." The announcement was part of a rollout of policies Smith would package under the Alberta Accountability Act. She said it would pass in the first term should her party win the April 23 election. The Wildrose would also draft recall legislation for constituents who want to take action against a member of the legislature they feel is not doing the job. There would be whistleblower legislation, a fixed election date, and mechanisms for citizen-initiated referendums. The latter has been a hot topic on the election trail in recent days given concerns that the Wildrose plan would give the green-light to those who want a referendum on the funding of abortions. Smith, on record in past years criticizing public funding for abortion, has said she won't legislate on that issue as premier. She also doubts a referendum on that issue would even be allowed, given that any decision to de-list would likely violate Charter rights. Redford, however, has said she is concerned as a politician and as a woman that the Wildrose would revisit deeply personal issues settled years earlier by the courts. Liberal leader Raj Sherman has said Smith is taking the province back to the past, leading him to proclaim: "This is Alberta, not Alabama." Smith said the bar would be very high to force any referendum. Those pushing for one would have to get 20 per cent of all eligible voters — about 500,000 Albertans — to sign a petition within six months of its launch. "You can't have somebody collecting signatures over years and years and years," she said. A federal judge would also have to sign off on the referendum to make sure it doesn't violate the Charter and is within provincial jurisdiction. It must also be revenue neutral. "We wanted to create a benchmark that was achievable, but still high," said Smith. "We don't think Albertans want to be consulted on every little thing. They value the role of their representative in a representative democracy, particularly if there are free votes." Redford, touring in southern Alberta, said Smith's party is not walking the talk on accountability. "My understanding is there are a number of (Wildrose) MLA candidates this week who aren't even going to show up at constituency forums," said Redford. "Or when they do show up at constituency forums, they're not speaking on behalf of themselves ... there are party representatives there speaking on their behalf. "I don't know how that's consistent with accountability at the constituency level." Smith is also promising to claw back the 30 per cent pay hike cabinet ministers under former premier Ed Stelmach, including Redford, voted themselves after their landslide election win in 2008. She plans to cut pay for all politicians by five per cent and reduce the eligibility rules for transition allowances that are currently allowing retiring politicians to leave the legislature with six-figure handshakes. In one case, retiring Speaker Ken Kowalski will receive more than $1 million to ease his transition from public to private life. Redford noted she has already launched an independent pay review on politician salaries, headed up by retired Supreme Court justice Jack Major.